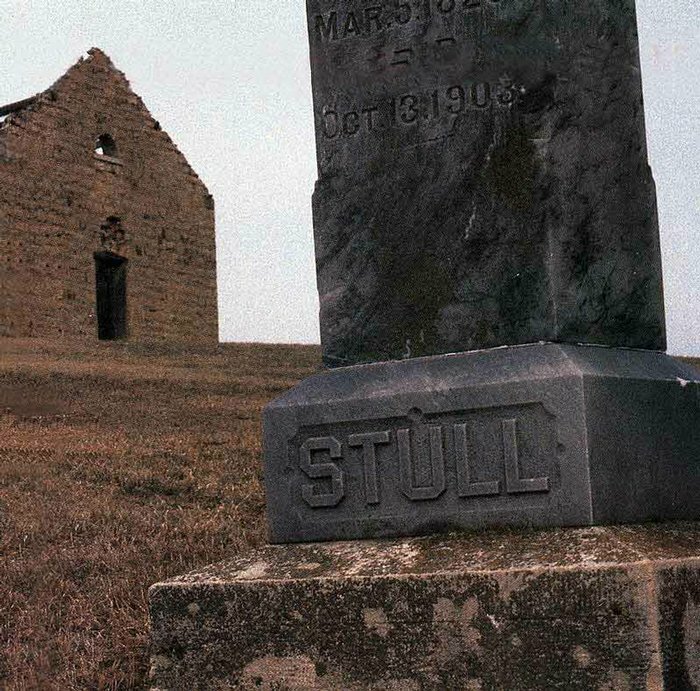 Stull Cemetery is a cemetery located in Stull Kansas. Still is a small town In Kansas with the population of about 20 people. For over a century there have been many tales of witchcraft and supernatural happenings all around the cemetery. Stull Cemetery is considered to be one of the seven gateways to hell, but to the residents, the cemetery is just another plain cemetery. To some who know about the legends of Stull Cemetery, it is their dream place to be on October 31 at midnight; hoping to see the Devil in person. According to Prairieghosts.com the local officials have banned outsiders from entering the city after 11:30 p.m. On March 20, 1978, Spring Equinox, more than 150 people gathered at the cemetery, because of rumors that the spirits of the ones that died violent deaths would be accompanied by the Devil in the graveyard. Surprisingly, no spirits showed up, but the rumors were still being spread. An actual headstone from Stull Cemetery. The cemetery’s legends grew during the 1970’s. One legend tells how accused witches were once hanged on a tree that once stood in the cemetery, according to Jennifer Eblin’s article on Yahoo! News Network. There is also a tale that the old church was once a barn were local men were brutally murdered, but when the church came around their spirits remained. Another tale talks about how the Devil had a child with one of the local witched, and the child was buried in the cemetery and his ghost wanders throughout the night. There have also been witnesses to strange happenings after visiting Stull Cemetery. A college student says he was grabbed by someone or something unseen. Others report strange memory loss after visiting the cemetery. All these tales and legends of the Devil, witchcraft, and other supernatural happenings around Stull Cemetery seem believable, but are denied by the residents. Is it because the residents are trying to keep the history of Stull Kansas a secret, or are these witnessing and legends pretend stories? It is up to you to decide and solve the mystery, or just study the history of Stull Cemetery. DrDevience.”Cemeteries & Graveyards: Stull Cemetery.” Fanpop.com. Fanpop Inc., 4 years ago. Web. 19 Oct. 2012. Taylor Troy. “Stull Cemetery” Prairieghosts.com N.P., April 2002. Web. 10 Oct. 2012. This site contains further information about the history of Stull Cemetery. This site contains information about how Stull residents feel about the reputation of Stull, and how they don’t want any unwanted rumors being spread. This site gives history on Stull Cemetery, and interviews with some of the residents.